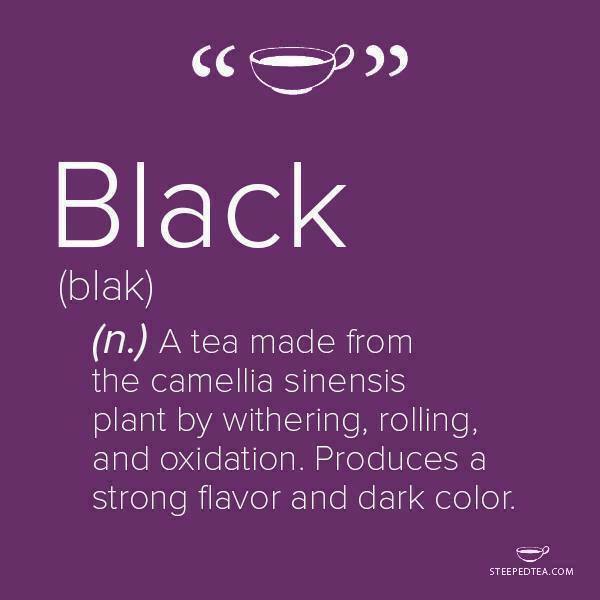 Tea Talk Tuesday – What is Black Tea? This week, I thought we’d start to talk about the various kinds and types of tea. If you aren’t any more familiar with tea than the (yucky) tea bags that you buy in the store, then you have no clue that Black, Green, and White teas all come from the same plant! It’s called Camellia Sinensis (ca-MEEL-e a sy-NEN-sis). Oolong and Pu’erh teas also come from this same plant. Over the weeks to come, we’ll discuss all of them. Black tea is a fully oxidized leaf with a bold flavor. It’s leaves are plucked and withered, then they are rolled and crushed to start oxidization. After that, they are fired in an oven to stop oxidization. Black tea is the most popular tea in the Western world. Traditionally, black tea comes from China, India, and Sri Lanka. Using a scale of 1-3 teacups, Black Tea contains 2 teacups of caffeine. Because of this, it promotes alertness and is a great choice for your morning tea. Black Tea should be steeped for 2-3 minutes and can be steeped only once.